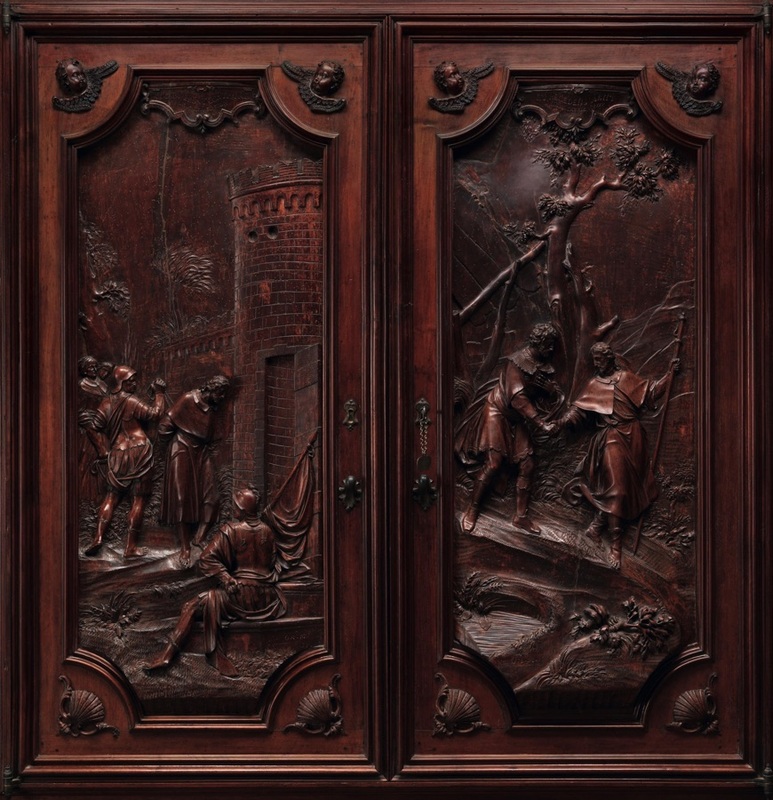 Around the perimeter of the Sala Capitolare’s chancel, the doors of the eighteenth century cupboards which once contained the Scuola’s books and documents, display a series of twenty-four splendid bas-reliefs carved by Giovanni Marchiori between 1741 and 1743, one of his greatest achievements as a sculptor in wood. 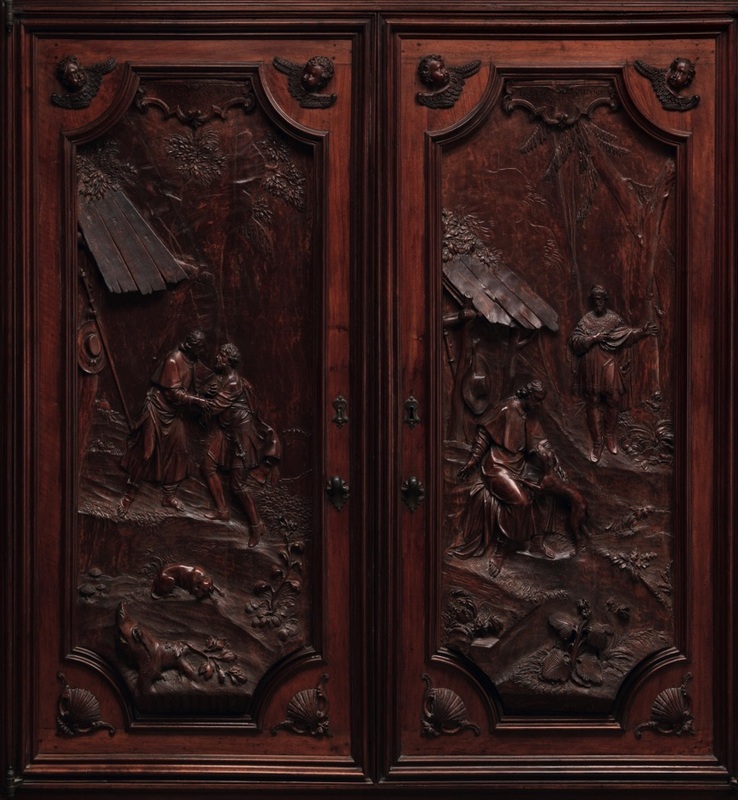 The single-doored cupboards show allegorical figures (Faith, Hope, Charity and Religion) while in the double-doored ones are narrated episodes from the life of St. Roch, which is conceived as an exemplary existence illuminated by faith and founded on charity towards others, rendered by the sculptor with great narrative skill and realism in their depiction of places and people. Developing in an anticlockwise direction, opening with Faith at the extreme right of the chancel, the story begins with Roch blessed by his father, one of the refined divisions of the cycle from the compositional point of view, and then Roch distributing his wealth to the poor. There follows a relief of Roch visiting the hospital in Acquapendente, one of Marchiori’s greatest sculptural moments, not only in his scene-setting but also in his delineation of the characters, whose varied expressions of suffering and hope are vividly rendered, then Roch healing the plague-stricken. The following two doors picture as many miracles performed by the saint. The right one narrates the healing of the plague victims of Cesena, a realistic picture of peasant life brusquely interrupted by the epidemic, then we see the so-called Cardinal Britannico who, cured by the saint, presented him to the pope in the next relief to the left, notable for its rendering of individual detail. The following doors begin the narration of the events linked to Roch’s stay in Piacenza: an angel appears to him in a dream, announcing that he will himself be struck down by the plague. To the right, Roch, now sick, is thrown out of the hospital in Piacenza. On the left, the saint, retired in solitude to a wood outside the city, prays God not to abandon him and God causes a spring of water to flow for his sustenance. Then, following allegorical figures of Hope and Charity, come two of the best-known episodes from the life of St. Roch, the moment in which Gottardo Pollastrelli discovers his dog taking food to the sick saint in his woodland retreat, and the subsequent meeting between the two. 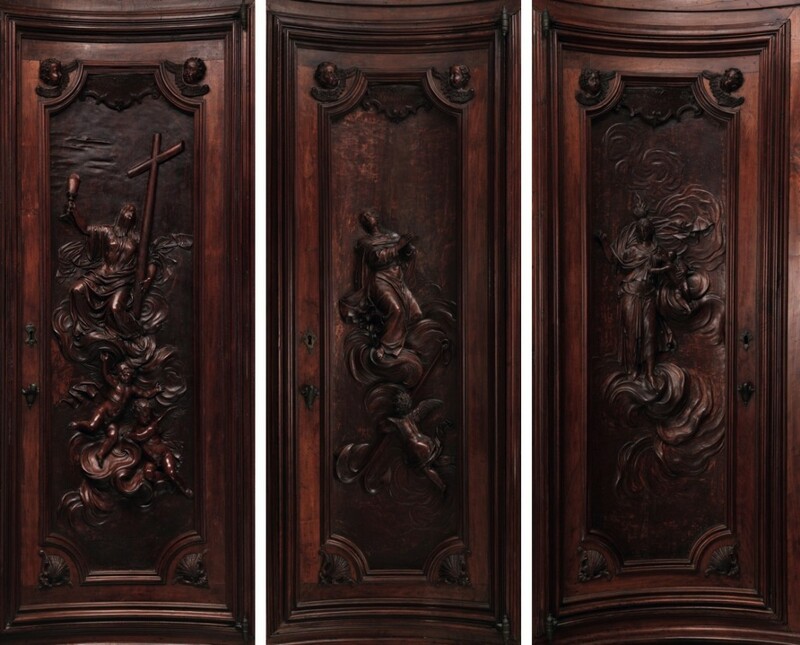 The carvings are among the most striking expressions of Marchiori’s narrative skill. On the left wall of the chancel, the next right-hand door, one of the most successful carvings of the series for the breadth of its composition, shows Roch and Gottardo addressing the faithful, who show their gratitude for the saint’s assistance. 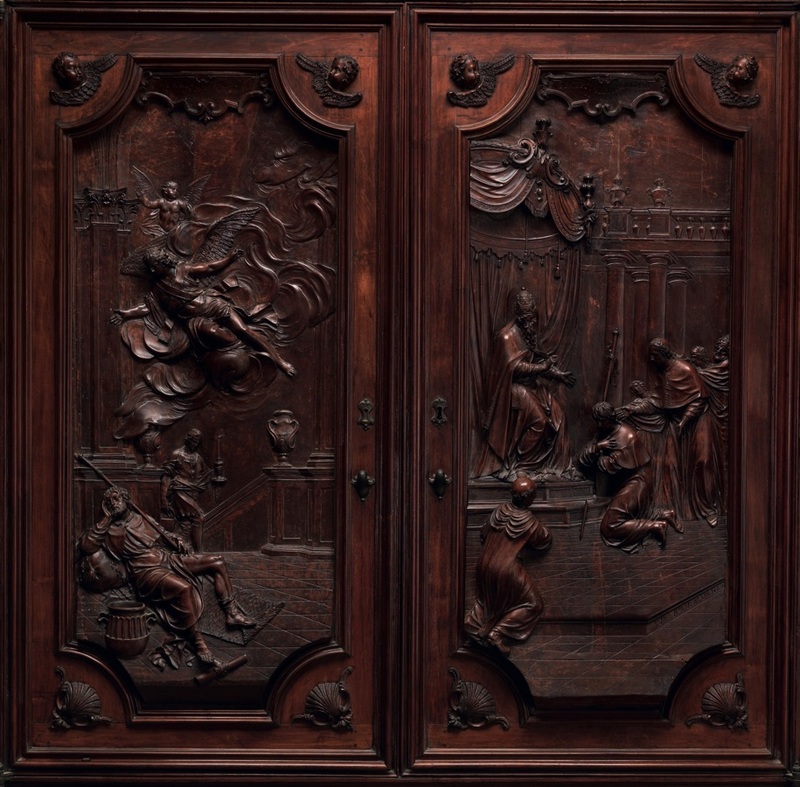 The left-hand door is more relaxed and intimate in tone, where Roch and Gottardo are visited in dream by an angel, who commands the former to return home. The following right door shows Roch and Gottardo’s leave-taking, an episode charged with a profound emotional intensity; on the left, the saint’s arrest is dramatically pictured, when, arriving in Montpellier in time of war, he is taken for a spy and, not wishing to reveal his true identity, imprisoned. Succeeding episodes refer to Roch’s incarceration. In the one on the right, the jailor sees the saint illuminated with divine light, in the left, the famous moment of the angel’s visit, whom the saint asks, and it is granted him, that those who invoke his name be cured of the plague. Finally, the last two reliefs tell of the moment when the jailors find the body of Roch bathed in divine light, while the left panel recounts how the governor, discovering that Roch is his nephew, orders that he be buried with full honours. Thus the biography of the saint draws to a close and the allegory of Religion rounds off the whole sequence.